Breast milk is best for babies. Apart from providing essential nutrition, it also helps them fight off bacteria and viruses. But not all mothers choose to breastfeed their newborns. And even some of those who are keen to do so do not produce enough milk all the time. Now, there’s a technological and business solution to help nursing mothers during those times when the flow of breast milk slows to a trickle. Developed by a team of electronics engineering students from Bulacan State University, MilkTrack is an app that allows mothers to buy and sell breast milk from each other. The milk can be picked up from and delivered to their doorstep. 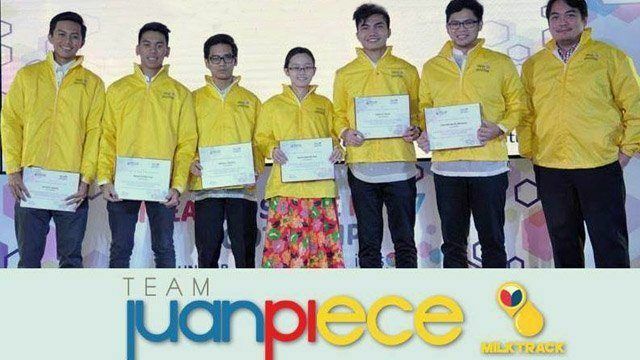 The team behind MilkTrack is one of four winners of the Third Philippine Startup Challenge (PSC), a nationwide contest for college students with an innovative technology-based business idea. It was organized by the Department of Information and Communications Technology (DICT) and the Philippine Software Industry Association (PSIA) in collaboration with Intel Philippines. The national finals were held last April 21 in Spring Valley, Roxas City in Capiz province. The team from Bulacan State University won under the software category of the contest. The app, which it said “is still in the final stages of development,” aims to help mothers gain access to “safe, uninterrupted resource of everyday breast milk.” Apart from the app and the delivery system, the team also developed a strict screening process of the mothers’ pregnancy booklets to ensure the milk’s quality. Winning under the Internet of Things category of the PSC is a team from the Iligan Institute of Technology of Mindanao State University. The team developed an app called HushTag that keeps track of a pet animal’s location. The app is linked to a GPS-enabled device that is attached to the pet’s collar. “HushTag is purposely designed for pet owners who want to ensure the security of their pets and realistically monitor their location, but not with a very expensive price,” the team behind the app said in its pitch to the contest. Two other student teams were recognized under the software category: Sea2Go, an e-commerce platform for fishermen in Davao City to sell their catch to a wider market; and TraSe, an app that maintains a database of professional trainings and seminars around the country. The teams behind these startups are based at the Ateneo de Davao University and Bulacan State University respectively. The winning startups will get the chance to receive mentorship and guidance from PSIA’s LaunchPad program and other tech startup experts, with HushTag receiving additional mentorship from Intel Philippines. “Additionally, the winners will also be given access to valuable networks within the country’s startup ecosystem,” said DICT in a statement. “The DICT is amazed by what these kids can do with the right guidance and mentoring from their professors and from the startup community as their ideas help make lives better for their community,” said Emmy Lou Delfin, program manager of the DICT’s eInnovation Group. Launched in 2014, the PSC is part of the government’s initiative to promote the country’s startup ecosystem and to encourage technological innovation among the youth. “We will continue pushing for innovation by challenging the youth to solve real-life problems through the PSC,” said Delfin.